Magnolia would like all moms to have a wonderful Mother’s Day, so we want to give you a special Mother’s Day gift of 2 x 80ml Elianto hand cream bottles and a RM10 AEON voucher! 10 winners will be selected to win this special Mother’s Day gift! Contest ends 11th May, so hurry! Find out more at F&N Magnolia. 1.1 F&N Magnolia Malaysia Mother’s Day Giveaway Contest (the “Contest”) is organized by F&N Beverages Marketing Sdn. Bhd. (“Organizer”). The contest is open to all Malaysian citizens and residents of Malaysia age 18 and above (as of January 2017) except employees and immediate family members of F&N Beverages Marketing Sdn. Bhd., the Organizer’s affiliates, subsidiaries, advertising/PR agencies and suppliers. 1.2 The Contest will run from 9th May to 11th May 2017 (the “Full Contest Period”). Only contest entries received within this period are considered eligible. F&N Beverages Marketing Sdn. Bhd. (“Organizer”) reserves the right to change, cancel, terminate or suspend the Contest at any time during the Contest Period without prior notice. 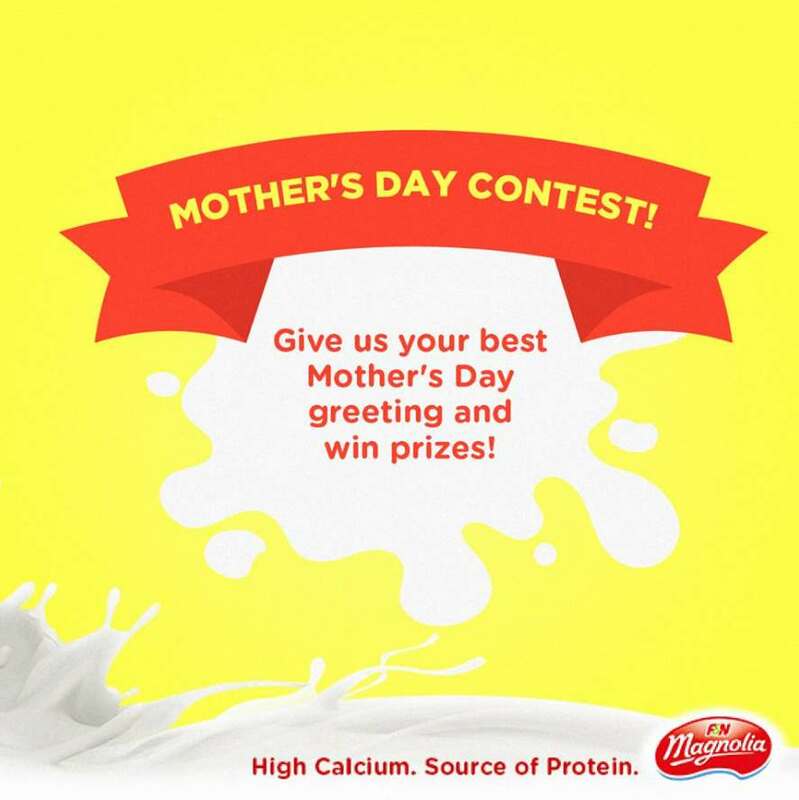 2.1 To enter the Contest, participants must comment with their best creative Mother’s Day greeting and include the hashtag #MagnoliaMilk in the comments section of the contest post. 2.2 Multiple entries are allowed. Incomplete or incorrect submissions will not be entertained. 2.3 All submissions are subject to the Organizer’s verification. The Organizer reserves the absolute right to automatically disqualify submissions which are incomplete, illegible or late (i.e: submissions received after 2:01 p.m. on 11 May 2017). 2.4 By submitting any entries, participants agree to be bound by the terms and conditions set forth without limitation. Entries must not include content that are unlawful, harmful, vulgar, obscene, hateful, or racially, ethnically or otherwise objectionable, the determination of which is up to the sole discretion of the Organizer. 3.1 Winners will be selected on most creative greeting subject to F&N Magnolia’s selection. 3.2 Winners will be informed via private Facebook Message on 11th May 2017. 3.3 F&N Beverages Marketing Sdn. Bhd. (the “Organizer”) will not be held liable in the event of non-receipt or delayed delivery of any form of notification to the participants. 4.1 Each winner will win TWO (2) 80ml bottles of Elianto hand cream and a RM10 AEON voucher. 4.2 The prizes will be delivered to the Winners’ home address via mail or courier service for all Winners within the Klang Valley as well as outside of the Klang Valley. 4.3 All transportation, accommodation, personal costs and/or any other costs, fees and/or related expense that are incurred to participate in the Contest and to redeem the Prize is the sole responsibility of the Winners and F&N Beverages Marketing Sdn. Bhd. (“Organizer”) will not bear any additional costs in regards to the collection of the prizes. 6.1 Winners will be notified on 11th May 2017 and the Organizer will be notifying the selected winners via Facebook Private Message only. A list of winners will be published on the Organizer’s F&N Magnolia Malaysia Facebook page on 14th May 2017. 1. This written notice (“Notice”) serves to inform you that your personal data is being processed by or on behalf of by F&N Beverages Marketing Sdn. Bhd. (“F&NBM” or “we” or “us”). Further, by submitting your details, you hereby consent to the processing of your personal data by F&NBM in the manner as specified in this Notice. We shall be processing the personal data that you have provided us with such as your name, national identity card number, contact number, address and any other information that we have requested from you. F&NBM will be processing your personal data, including any additional information you may subsequently provide F&NBM, for the purposes of conducting this contest and contacting you (if necessary). 2. The personal data that you provide us may be disclosed to our service providers only for the aforementioned purposes. You are responsible for ensuring that the personal data you provide us is accurate, complete and not misleading and that such personal data is kept up to date. You may access and request for correction of your personal data and/or to limit the processing of your personal data, or make any enquiries or complaints in respect of your personal data, by contacting us. 7.1 The Organizer reserves the right to cancel, terminate and/or suspend the Prizes, without the need to provide any prior notice. The Organizer shall reserve the right at its absolute discretion to substitute any of the Prizes with that of similar value, at any time without prior notice. All Prizes are redeemed on an “as is” basis and are not exchangeable for credit, other items or voucher in part or in full. 7.2 The Organizer’s decision on all matters relating to the Contest is final, conclusive, and binding. No correspondence will be entertained. 7.3 Participation in the Contest and acceptance of any Prize(s) constitutes an irrevocable permission (unless otherwise notified by the Participants) for the Organizer to use the Participants’ names and photographs for purposes of publicity and advertisement without any compensation or need for prior notification to the Participants. 7.4 The Organizer shall not be liable in the event the Prize(s) are lost, spoilt, damaged or stolen during or after collection of the Prize(s). All Participants unconditionally agree to assume full liability and responsibility to the extent permitted by law in the event of any loss, mishap, injury, damage, claim, or accidents (including death) suffered as a result arising from their participation in this Contest, redemption and or use of the Prize(s). 7.5 By participating in the Contest, Participants are taken to have read, understood and agreed to be bound by these Contest Terms & Conditions, and accept that all decisions by the Organizer are final and binding. The Organizer reserves the right to change, amend, add or delete any of the Contest Terms & Conditions at any time without prior notice to the Participants and the Participants agree to be bound by such changes.